Want to see amazing creations from our members and learn a little about our makers? Hi, my name is Alexana. I’m a sculptural artist recently graduated from University specialising in bespoke metal sculptures. 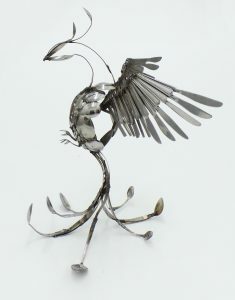 I use up-cycled and new stainless steel cutlery to create striking figurative pieces inspired by animals and nature. I’m heavily inspired by the natural world and try to imbue a sense of life and movement within every piece that I make. Birds are my biggest source of inspiration though I also do mammals, lizards and plants. I am available for commission and am constantly trying new designs so if you want something unique, please get in touch. I love living in Wales. Everything from the vast green countryside to the rugged and beautiful coastline inspires me, even the weeds in my garden are not safe from being rolled into clay! My work is quirky and modern, sometimes functional, but always beautiful. I’m 18 and have recently moved to Cardiff to study engineering at Cardiff University. I’ve been designing personalised prints for two years, ever since I noticed there was a gap in the market for bespoke gifts at affordable prices. I pride myself on being able to design any shape with any words to create a unique picture. I then print and frame it so you can give the perfect gift. In two years and over 150 orders I have not yet found a shape I can’t design. Your shape, your words, your gift. My name is Catherine Bhogal, my shop on Etsy sells original oil paintings of figures, seascapes and landscapes. I accept commissions for portraits. I am an artist based in a village in Caerphilly Borough, I work from home. My work is colourful and inspired by my natural surroundings. I love capturing light, movement and nature’s true colour. Ceramics for Everyone makes, creates, designs and decorates porcelain and bone china tableware. Hello, I’m Ceri and I’m an artist and illustrator from Coity. My work reflects my passion in life for animals, especially Westies, but I also paint landscapes and floral images. My work is colourful, contemporary and whimsical. I often give my paintings a narrative twist, placing animals in humorous situations, which will hopefully bring a smile to your face. I work in acrylic paints, sometimes using collage. I sell original artwork, giclée prints and greetings cards. I have trained as a secondary school Art teacher, and previous to that worked at The Royal Mint as a Designer Engraver. My name is Cheryl and I work with polymer clay. I began by making miniature food for dolls houses but in 2015 I started making jewellery and other pieces to take my craft out to a wider audience. All the food beads are designed and created by me in my home studio before putting together as a piece of jewellery. Unique hats and headwear designed and handmade in Cardiff, Wales. Using traditional techniques and fine craftsmanship, Claire creates effortlessly wearable pieces which are as luxurious and elegant, as they are fun and glamorous. Choose from exquisite hand-blocked millinery in a range of striking polka dots, leopard print and hand-painted feathers, or birdcage veils and hand-painted silk hair vines with a twist. From brides looking to showcase her personality on her special day to those who feel never completely dressed without something special in their hair, Claire has created a collection which can be adapted to suit your personal style and look. I make traditional and contemporary coppice products and wooden gifts for the home and garden. I am currently restoring a 9 acre redundant hazel coppice in Newport called Ladyhill Wood. I work with both the hazel that I coppice and with bought in locally sourced sustainable timber. For the most part, I can tell you exactly which woodland the item you have purchased originally came from! If it’s made from Hazel I can practically take you to the tree itself! Although practical, my products are mostly bought emotionally, customers fall in love with a particular piece that resonates with them. Hi, I’m Andrea… the Dragon of Dragon Art Glass! I live in the small former mining village of Senghenydd, and I simply adore working in the medium of glass! The multitude of colours is always inspiring and the many different techniques available makes sure you are learning something constantly, and allows you to strive and continuously improve and change. I work with sheets and rods of glass and glass powders, which I cut, shape and form with the help of a pattern, a few hand tools, lampworking torch and kiln – and end up with bowls, beads, suncatchers, panels and jewellery. Driftword allows you the opportunity to design and personalise word art. Simply choose a word and then start designing how you would like the word to look, choosing from our own stock photograph designs of letters of the alphabet. All the alphabet letter photographs are totally unique, using driftwood pieces, all of which have their own individual look and characteristics. The driftwood was collected by us from local South Wales beaches, assembled into the letter designs you see on these pages, then finally photographed by us. 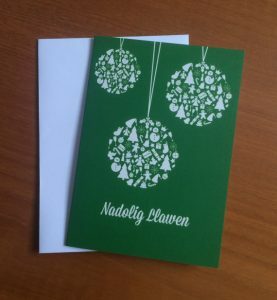 I am an artist and designer based at The Bone Yard in Canton, Cardiff; I have a passion for illustrating, designing and binding books and creating beautiful paper cuts! 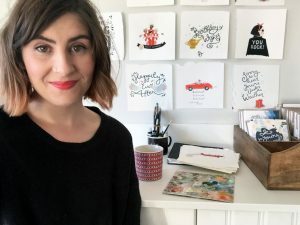 I specialise in making handmade books and illustrations for general sale as well as working with clients to create personalised, and unique pieces. I also make a selection of related items including bookmarks, sketchbooks and cards. My name is Shirley, I’ve been making handcrafted items since I was 4 years old and am now highly skilled in a wide range of crafts. I started making jewellery in 2011 and opened my Etsy shop 2 years later. I sell a selection of classic-style beaded jewellery as well as bookmarks, keyrings, bag charms, wine glass charms and beaded snowflake Christmas decorations. I’m happy to accept custom orders, so if you have something special in mind please feel free to contact me with details of your requirements. In a small house in Caerphilly, Wales, there lives a girl, a boy, two manic rabbits and a little spare room full of tools and smiles and fun. It’s a happy magical creative place and it’s home. My jewellery is all made by me, by hand, in my studio in Caerphilly. I work predominantly in sterling silver and much of my work reflects the fact that my favourite tool is my piercing saw. 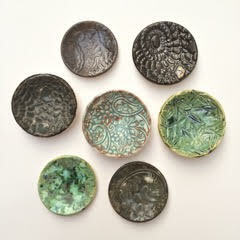 I also work in gold, copper, glass, and enamel, and I’m constantly adding new media to fit the designs in my head. Thanks for visiting our small space on the internet. We hand-make candles here at our small workshop in Cardiff, the capital city of Wales. No flash packaging, just beautiful, organic candles. Hopefully, you’ll buy one of our candles and, in return, we will put a little light in your life. I’m an illustrator and designer working in Cardiff with a love for drawing and doodling, couple this with a love for animals and comedy puns and I am a happy bunny. My work is created in pen and ink and then reproduced as a wide selection of prints and greetings cards ranging from the ‘artsy’ to the humorous. As well as animals my work is inspired by organic form, scientific illustration and pattern. Come see my wares – all handmade in sunny Wales! Huggles and Hideaways designs and creates a range of toys for babies and children of all ages. All CE certified and many suitable from birth, these sensory toys are built to be played with. We believe in celebrating simply with family and friends; a handwritten note, a surprise card in the post, or a sweet little gift, just because. This inspires our sweet and simple stationery co. – joyful, positive messages and beautiful, nature inspired illustrations adorn our greeting cards, art prints and gifts. Everything we make is originally illustrated in our home studio and printed locally. Jewellery, jewellery, jewellery – a total obsession, I have adored it for as long as I can remember. Now through Etsy I am living the dream, creating both a range of readily available pieces and bespoke items. I work mainly in silver, embellishing with pearls and semi precious stones, but also in gorgeous rich toned brass. My inspiration comes from different areas – living in rural Wales, I see wonderful shapes and textures all around me; being a yogi I trust in the power of semi precious stones and crystals; and finally I am mad about hearts – they appear everywhere in my work. Hi, I’m Kirsty and I’m a freelance graphic designer living in Cardiff. I create greeting cards, prints and custom designs and can be entertained for hours with a good bit of typography and a icon or two. My etsy shop is only a baby, but whether it’s a movie quote, a personalised print to welcome a new baby or an alcohol based pun masquerading as a birthday card, there’s something for any occasion! 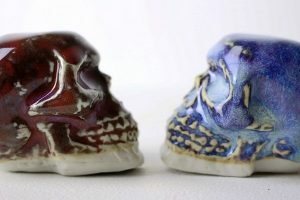 Hi, my name is Kathryn , I produce hand crafted alternative ceramic art, decorative wares with an emphasis on vivid contrasting colour and texture. I graduated from a ceramics degree in 2014, at Cardiff Metropolitan University. I created Hybrid Sea Creatures , born out of nautical tales and narratives of mythical creatures. From 2014 -2015 I took part in the Inc Space incubation unit, developing a range of ornamental skulls, comparing the modern use of skull symbolism, to historic memento mori. I also produce wheel thrown animals which reference ceramics of past decades, alternative decorative ware, seasonal items, jewellery, and illustrations. The owner/designer/maker of La Martiz Handmade is me, Martina, an Italian lady that moved to Wales in 2014. As a wool artisan, today my mission is giving a new look to an art too many times considered “old fashioned” and making it wearable, modern, contemporary and at the same time cosy, comfy, and warm. My inspiration come mostly from my travels around Europe, so I am likely to mix scandi patterns, urban contemporary designs with eastern European folk colours. 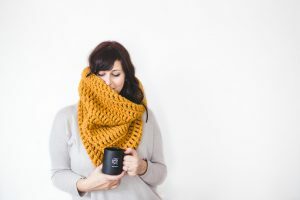 My best selling products are the chunky scarves: they are usually custom made, well presented and branded with a wood tag and available in a range of prices. I am a Cardiff based jewellery designer and maker, originally from Japan. My current practice follows enamel. I find inspiration in Japanese traditional design patterns, which often represent auspicious symbols and also natural and historic landscape of the places I visit as well as Wales, my adopted home. I work in enamelling in part to respect the old craftsmanship and inherit the skills, but most importantly I value hand-made works that express the warmth of nature and human touch. If my work could be a special part of someone’s life, I would be most honoured. Love & Lovelier – Wordy Contemporary Welsh Ceramics – Postcards, Love-spoons, Brooches, Dishes. Ceramics handmade in Wales. I am English, but I live in Wales so I like to inject a bit of British flavour to my pieces. A lot of the Love Spoons (which are traditionally Welsh) have words in Welsh written on them. I have a love of words and colour and I like to combine the two in my work. I love doing custom pieces so please contact me and we can work on something perfect just for you! Hi my name is Lauren and I run the shop Loz’s Jewellery. I currently make jewellery on a part time basis and I’m always coming up with different ideas. So feel free to check out my shop. I’m a jewellery maker/designer, working from my studio in the Printhaus in my hometown of Cardiff. My work is made with the intention of inspiring the happy feeling of found treasure. 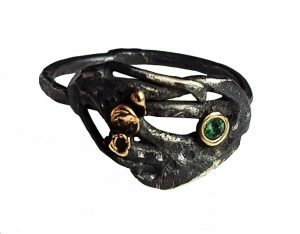 My jewellery designs feature a range of textures, patinas and finishes exploring the concepts of weathering, aging and wear. Each piece is a one-off. I use carefully chosen, ethically sourced gemstones, contrasting metals and bright flashes of keum-boo to bring my work to life. All of my jewellery is very tactile, and intended to feel as interesting as it looks. I can happily provide fair trade or eco-friendly, recycled & traceable gold & silver on request. Hi, my name is Ruth. My products are Handmade in Wales using British materials. I create bags and accessories using felt, linen and wool from British companies. I am excited and energised by the fantastic textures of my materials and by the vivid colours of the felt. I work from my home in a remote part of West Wales where I am inspired by the local cottages to stitch my appliques. My husband hand forges the metal buttons and bars that fasten my bags. To brighten up your world please visit my shop using the link above. My name is Venla and I’m an illustrator & printmaker originally from Finland but currently residing in Cardiff. My shop is MoonAndBearShop and I make clothing, accessories & home decor items. I’m inspired mainly by nature, animals and Nordic folklore and like making simplistic designs with bold colours that stand out. All the items are designed and hand-printed by me at The PrintHaus studios down in Canton. I make beautiful handmade flowers and plants using soft blended Merino Wool felt! Each petal and leaf is completely unique. They are individually hand cut, hand sewn and teased into shape. Each creation would be a perfect make for unforgettable weddings, for the home, and as perfect gifts for all occasions! 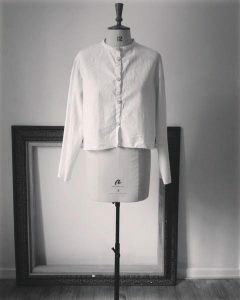 Nomadic Me is an ethically focused fashion and design label which manufactures garments and lifestyle products using organic and natural materials. The designs are minimal and appreciative of high quality raw materials, uniformity in design is never adhered to in this brand as each item is seen as unique. All fabrics used are either left in their natural state or hand-dyed with delicate low emission pigments, with other raw materials such as cork, wood, stone and metal used to evoke the rawness of nature. Owner and creator of Pick Me. I’m trained as a florist and I work with both real and artificial flowers, pretty much anything floral! 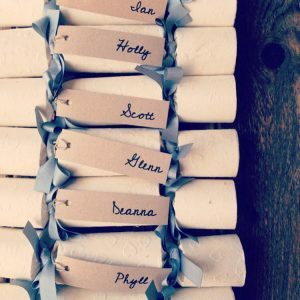 Pick Me on Etsy includes artificial items for all of lives events from flower wands for flower girls to adult hair accessories! I love to collaborate so if you’re wanting anything particular feel free to get in touch! Located in Sunny Pembrokeshire, West Wales Pinky Bear Designs is a small independent Welsh company designing and manufacturing original laser cut, engraved and hand finished products. All products are designed and created in house by designer/ maker Jacqs Scourfield. Pinky Bear Designs offers a range of jewellery, gifts, home decor items, craft essentials, bespoke wedding favours and gifts, corporate gifts and products. As well as offering a sub contract cutting and design service. Pinky Bear Designs aims to bring creativity to the world one laser cut piece at a time. I work from my home studio in Tongwynlais, Cardiff making ceramic beads and jewellery. For me jewellery must be eclectic in style, like a piece of string that’s travelled through life collecting the odd interesting object along the way. Both my beads and jewellery are inspired by the world around me, usually from my walks through the industrial landscape that is being reclaimed by nature here in South Wales. To me my work acts as the pages of my journal, reflecting my many interests and inspirations. Hi everyone I am Emily of Reclaimed by Nature based in Blackwood, South Wales. I make pretty things out of recycled and handmade paper and have a range of unique greeting cards and wedding favours amongst other paper related items. Many of my items also include seeds so you can plant them out once you have enjoyed them. This reduces your waste going through the system and lets you return things straight to the earth whilst helping wildlife with pretty flowers too! I am always happy to create bespoke designs – please just get in touch. Hi, I’m Ruth. I live and work by the sea in West Wales. 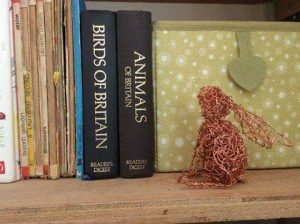 I am an artist/maker working with British wool fibre to produce felt pictures, creatures and sculpture. 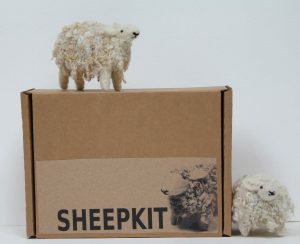 I have a range of kits and cards featuring my needle felted animals and birds. I am inspired by nature; from flocks of Jackdaws wheeling around the skies to raindrops on cobwebs; the flowers in the hedgerows and their seedheads. I spend time looking and photographing the world around me. I’m an artist working from my studio based in the South Wales Valleys. I’ve lived in many countries and have many interests. I’m particularly drawn to colour and light which reflects across varied themes, from flowers and nature, to portraits, to Grand Prix! I paint mostly in oils and acrylics, and in a variety of sizes from large stretched canvases to small works on special papers and miniature collectible art cards. I also produce gallery standard giclee reproduction prints of my work. Feel free to contact me if you are interested in something specific as I also take on commission work. I trained as a painter at Edinburgh Art College and have been a printmaker for 25 years. The Arts Council of Wales has awarded me two grants in the past to develop my work. I am now a wood engraver and recently elected a member of the Society of Wood Engravers. There are only 3 to 4 members in Wales. I have exhibited with the Society in London, Seattle and Beijing. I specialise in landscapes and love drawing living things, on the spot. I grew up in Edinburgh but have been in South Wales for 23 years and find the landscapes of South Wales very compelling. All our products are made from Nepalese lokta paper, a handmade artisan paper indigenous to Nepal. I use this paper for it’s fibrous texture, sumptuous colours and beautiful patterns. I love the natural and imperfect characteristics of the paper due to its handmade process. I work from my home/studio in Wales. Everything I design and make is done with great pride and care, paying attention to every detail and finishing touches. You will find a selection of cards, wedding favours, Christmas crackers, note books and paper garlands in our Etsy shop. My range of fun and functional gifts for children (and the young at heart) include reversible aprons, patchwork quilts and toy play mats, and as the festive season approaches, quirky Christmas stockings and decorations – all made in gorgeous fabrics and with great attention to detail, and sometimes embellished with hand embroidery, applique and buttons. Everything is designed and created by me in my sunny sewing room in Bridgend. I love combining different prints and colours, and coming up with new ideas, so many of my items are one-off designs and others are made in limited numbers. Hello! My name is Kath and I run the power of greyskull bespoke leggings company. My leggings are designed, printed and made in the UK. I design all my own prints, have the digital files printed in Yorkshire and then cut them out and make them up in my studio based here in Penarth. Hi my name is Beth. I first found my love of wire when I was completing my A-level art creating 3D shapes from line drawings. Since then I’ve been creating sculptures inspired by nature. I really enjoy making new pieces and seeing them develop into their own unique character. I’m also fascinated by shadows the wire creates, this adds an extra dimension to my work. 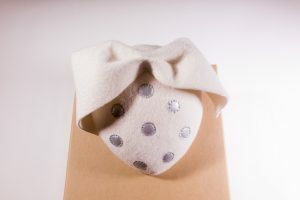 Hi, my name is Karen, and I create one off hand-dyed silk scarves, wool felted scarves, brooches, and other accessories. My Etsy shop opened a few years ago with only a few items, and is building steadily. I love colour, often working opposites together, and when I attend craft fairs, my ‘shop’ is a rainbow of silk! I take on custom work, and often have repeat orders from regular customers. If you are looking for scarves and accessories, made from natural materials, one-off and individual, as a gift, for a special occasion, or just as a colourful treat, please visit my shop using the link above. Rachel works with classical narratives to create wearable ceramics. She is passionate about using her work as a vessel to draw a little bit of fantasy from her classical inspirations and into her pieces through the ornate detail and unusual nature of her practice. 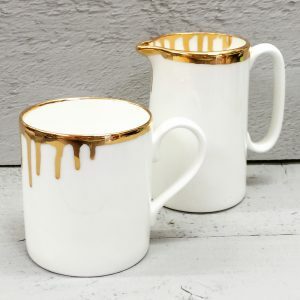 Working with porcelain which she stains to create a rich palette in her work whilst still obtaining vivid detail, clear glazed to create tactile functional pieces and with a dash of gold. Her work is the result of a desire to create pieces that form a tactile narrative, add a little more beauty into the world. Hello, I am South Wales based artist and graphic designer Vicki Ashurst with a love for all things inked. 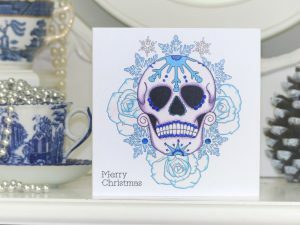 My card designs are inspired by traditional tattoo flash and each one is handmade with a dusting of sparkle and a sprinkle of love. Vickilicious is all about re-discovery of a childhood passion for me – I was a Graphic Designer in a branding agency and I spent most of my time in front of a computer. I had forgotten how much I loved just putting pencil to paper and drawing for pleasure and to create something beautiful. In March 2015, I dusted off my coloured pencils and pens and Vickilicious Designs was born. 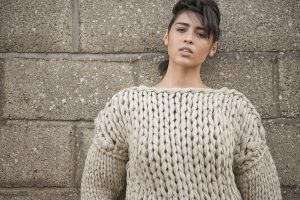 Xandra Jane is a sustainable, luxury clothing line for the modern day consumer. Reconnecting you to your clothing whilst rebelling against fast fashion. Our garments are assigned unique journey cards detailing their creation from start to finish. Would it be possible for my products/ easy shop to be featured on these lovely pages? If you’re Cardiff and Valleys based then yep, please just join the etsy team and you will find the details of what to send me there.